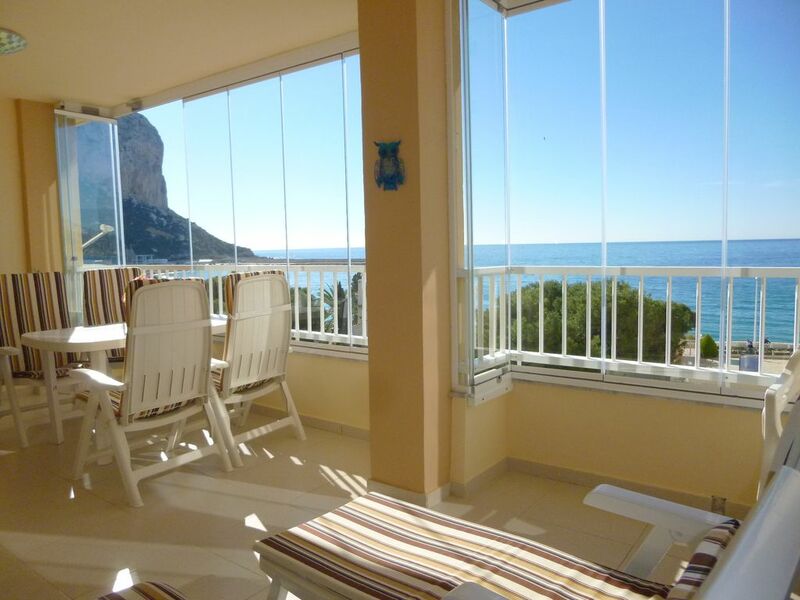 A dream vacation in sunny Calpe. The sun, the beach, nice little restaurants by the sea, you thought about it all year. Today you can finger your dream. To do this, follow the instructions. I propose to rent (day, week, fortnight, month), day of arrival to choose from, a beautiful apartment with sea views. You will find all the comforts that one is entitled to expect with a large living room overlooking the sea, two bedrooms, one with a double bed (linens are provided), a bathroom with bath or kitchen allowing you to prepare lunch to take facing the sea on a large sun terrace. Nothing is missing as dishwasher and washing machine also make life easier every day. For leisure, do not worry: you will find a TV with French channels Fransat or local channels. And if you prefer reading in peace, do not worry. Make double blow and enjoy the sun sipping your favorite whodunit on loungers on the terrace that can be closed in case of wind or the pool. What enjoy a rare moment. But Calpe, this is not the sea. It's also the mountain walks, nearby golf, water sports, sea fishing or long walks by the sea. What replenish energy. This table please, so feel I am there to welcome you. This is an attractive apartment which is well equipped and with enough room for four people although only two of us were staying. The standard double bed is comfortable although a king size bed would be an advantage. The kitchen is adequate and we cooked a few meals. An electric heater was provided since there is no other heating and it is definitely required in the winter evenings. There is a large terrace with a glass curtain which can be moved to one side pane by pane. This makes the terrace a lot more usable in the winter particularly if it is windy. We go walking most days and like to sit and enjoy the last few hours of sun when we return in mid afternoon. We emailed the owner to inquire when the terrace was in the sun and were told it received sun all day. This is incorrect, we were disappointed on arrival to realise that the sun goes behind a large block of flats at 14.00 and then behind a smaller block. There is therefore little sun after 14.00 in the winter at least. This may be a bonus in summer with no air conditioning. All spanish apartment blocks suffer from noise due to their method of construction but this block seems particularly noisy and most apartments seemed unoccupied. One night there was a loud snorer in the next apartment and he? might as well have been in our room. The block is mainly surrounded by other residential buildings, there are only a limited choice of restaurants nearby. The old town is a better location for a winter stay for a choice of evening entertainment. We took up the option of paying a supplement for cleaning. Schön, angenehm, gefiel uns super!! Appartement très agréable avec une superbe vue mer. Superbe accueil de Christine la propriétaire, dans un appartement en front de mer très confortable et très bien situé dans la zone touristique de Calp. Vous avez découvert mon petit Paradis et moi des locataires charmants. Sehr schöne und saubere Wohnung mit großem Balkon. Die Vermieterin ist sehr freundlich und hilfsbereit. Wir kommen wieder! Heureuse que vous avez passé un bon séjour dans mon petit Paradis. Glücklich, dass du einen schönen Aufenthalt in meinem kleinen Paradies hattest. Ich freue mich darauf, Sie wiederzusehen. Un superbe séjour de 6 semaines dans un appartement idéalement situé, avec sa grande terrasse permettant de profiter d'une vue magnifique dont on ne se lasse pas. L'appartement bien équipé est propre et tranquille, les lits sont confortables. Calpe est une ville agréable à découvrir à pieds, de belles plages et une jolie digue, le Peñón d'Ifach d'où on peut admirer la ville, une variété de restaurants près de la mer ou en ville. En voiture, on peut découvrir la très belle Costa Blanca de Valence à Alicante et son doux climat. Et que dire de notre hôte, Christine, qui ne ménage pas ses efforts pour que notre séjour soit parfait ... attentionnée, disponible et attachante❤ Nous espérons avoir l'opportunité d'y revenir. Un couple de québécois enchantés de leur séjour!!! Je suis ravie que ce petit coin de paradis vous ai plu autant qu'à moi. Je vous dis merci pour tout et j'espère vous revoir un jour. Calpe is a municipality of the Valencian Community, located in the northern coast of the province of Alicante in the region of the Marina Alta. It houses 30 000 in winter. Un forfait pour le ménage sera demandé le jour d'arrivé de 30,€. Le locataire s'engage à ne pas amener des personnes supplémentaires sans l'autorisation du bailleur, à ne pas sous louer le logement, à user paisiblement des lieux, à s'assurer contre les risques locatifs. La remise des clés se fera le jour de l'arrivé et le jour du départ. La garantie (caution) sera restituée suivant l'état des lieux le jour du départ ou au plus tard dans les 10 jours.